The University of Rio Grande and Rio Grande Community College’s Director of Campus Computing and Networking Kingsley Meyer (left) has been selected as one of the two inaugural Doug Gale Outstanding Service Award recipients. The award honors Ohio individuals who have provided exemplary service to OARnet as well as their institutions and communities. RIO GRANDE — The University of Rio Grande and Rio Grande Community College’s Department of Campus Computing and Networking works to keep Rio connected using the latest technology to provide a high quality education to students locally and globally. Because of this effort, the institution is proud to announce Director of Campus Computing and Networking Kingsley Meyer is one of the two inaugural Doug Gale Outstanding Service Award recipients. The award presented by the OARnet (Ohio Academic Resources Network) honors Ohio individuals who have provided exemplary service to the OARnet organization, their institution and their community. Meyer said he is glad to receive the award and continue working with OARnet. Meyer has been at Rio since 1988 and played a key role in the institution’s initial connection to OARnet. He also helped pioneer bringing broadband service to Rio and Gallia County. Rio President, Dr. Michelle Johnston, said she is grateful for Meyer’s work in bringing these services to the community and keeping Rio connected. Meyer said last month marked the 30th anniversary of the State of Ohio Network and the Supercomputer Center, known as OH-Tech, which started to provide high-performance computing in the state. Meyer said having access to this service is a key component in providing high-quality education to students. This is Meyer’s second award while at Rio. In 2010, Meyer received the Ohio Broadband Hero Award from Connect Ohio and Connected Nation. 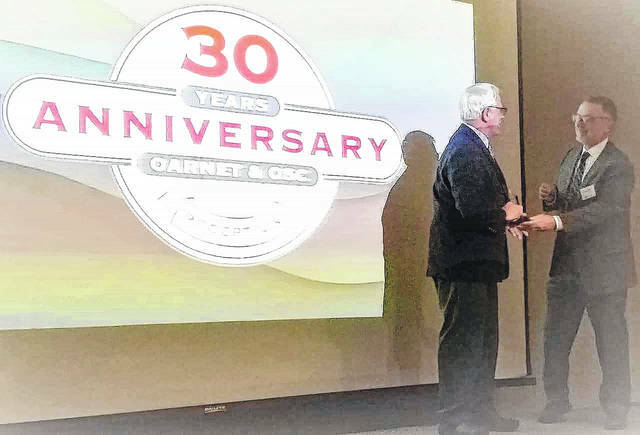 Meyer earned this award for his dedication to helping establish the University of Rio Grande’s first Internet connection and leadership in several regional broadband committee initiatives. Today, the university has more than 30 buildings with fiber connections and widespread Wi-Fi hotspots. Meyer has also been influential in advocating for broadband options to the entire Southeastern Ohio community, including area schools and businesses. Through Connecting Rural Ohio projects in Vinton and Crown City, Meyer helped establish Community Computing Centers where he taught classes and installed Wi-Fi equipment in area homes, women’s shelters and churches.